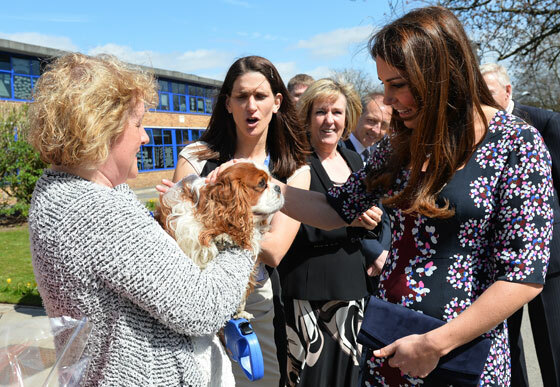 The Duchess visited The Willows Primary School in Wythenshawe, Manchester to launch a new charity initiative involving her new patronage Place2Be. The Willows Primary School has long been regarded as one of the city's most successful primaries, overcoming high local unemployment rates and poverty to be ranked as outstanding. Kate is not the first royal to visit the area which is home to 66,000 people. In 2009, Sarah Ferguson, Duchess of York, spent ten days in the estate as part of an ITV Documentary 'The Duchess on the Estate'. Those of you from the UK will recognise the area as the backdrop to Channel 4's 'Shameless'. The Duchess travelled from London to Manchester via train. Tuesday Porritt kindly shared a photo of Kate leaving Wilmslow train station wearing the unidentified pale pink coat she wore to Laura Bechtolsheimer and Mark Tomlinson's Swiss wedding in March. 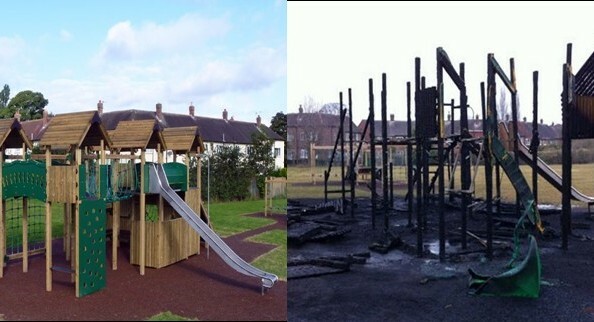 Staff at the primary school and the local community have come together in a heroic effort to clean up the Junior Playground after arsonists attacked the school just hours after Kate's visit was announced. Three thirteen-year-old boys were arrested on suspicion of arson following the fire. The people of Wythenshawe showed tremendous community spirit in their efforts to get the playground cleaned up before today's royal visit and have launched a campaign in the hopes of raising £45,000 to restore their beloved adventure playground Fort Henry. If you wish to donate you can so by clicking here. 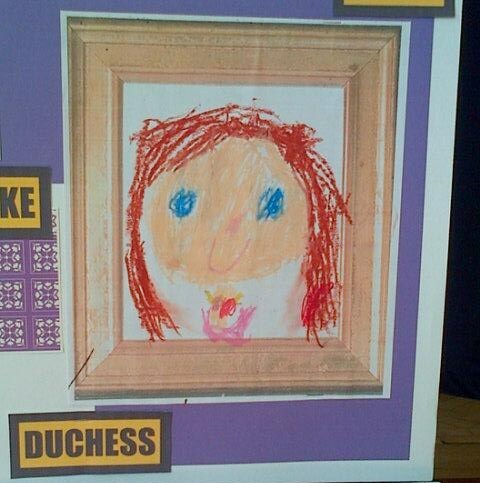 The creative pupils at The Willows Primary School share their drawing of Kate. Kate enjoyed chatting with the pupils. Accompanied by local John Bishom, a Comic Relief ambassador, Kate met staff, pupils and local families who discussed their experiences. The Duchess launched the M-Pact scheme designed to help families affected by alcohol and substance abuse, a partnership between the Royal Foundation, Comic Relief and two of Kate's patronages, Place2Be and Action on Addiction. The new programme combines Place2Be's in-school counselling for children and parents with the expertise of Action on Addiction's 'Moving Parents and Children Together' programme. 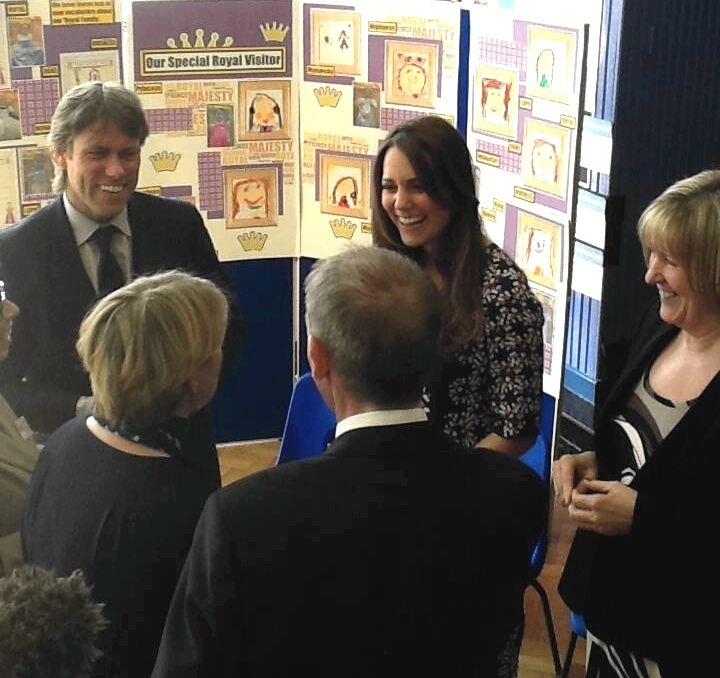 It's great to see two of Kate's working together to provide this excellent programme which I'm sure will help so many. The visit provided Kate with a first hand look at the work Place2Be does with schools; supporting children with emotional issues and providing workplace learning and training to provide practical approaches that enable school-based staff to support individual children more effectively. The Duchess took part in a tree planting ceremony. Kate delivered a short speech which can be viewed at ITN Source. She was obviously very nervous, as public speaking certainly takes getting used to and I suspect it will become easier for her with practice. She did very well focusing on the destructive affect parental addiction has on children and it's clear she's very passionate about her role. "Addiction is a hugely complex and destructive disease and its impact can be simply devastating. All too often, lives and families can be shattered by it. Through my patronage with Action on Addiction, I feel fortunate to have met a wide range of inspirational people who have overcome addiction. It is so encouraging to see with the right help - like that of Action on Addiction - it can be conquered. But those who are addicted are not the only victims. I have been struck by the profound and deeply damaging impact it has on the children of affected parents. Research has shown that children of those who are addicted are seven times more likely to have addiction problems themselves. They are also brought up surrounded by fear, instability and chaos. Last year, I asked The Royal Foundation, which I share with William and Harry, to see what could be done to help these children. In partnership with Comic Relief, our foundation commissioned a piece of research to explore this issue. Today, it gives me an enormous feeling of pride and excitement to launch a programme that will bring this research to life. Place 2 Be delivers exceptional specialist counselling services in schools. Action on Addiction's MPACT (Moving Parents and Children Together) programme delivers life changing and expert support to families affected by addiction. The Royal Foundation has simply brought these two outstanding charities together to deliver a programme that will ensure that many children living with addicted parents will be identified, supported and guided to look towards a positive and hopefully, addiction free future. I would like to thank The Royal Foundation for all that they have done to make this happen. Thank you also to Comic Relief, Place 2 Be and Action on Addiction for working so brilliantly with them. The cycle of addiction needs to be broken. My hope is that through this specialist and targeted delivery of care, these children will have the best possible start in life - the one that they deserve." The Duchess looked striking in the Erdem Sophia Visconti-Bloom Dress. The navy-blue, burgundy, white, blue and pink Visconti-bloom silk-crepe dress has a square-neckline and sheer half-sleeves. The fitted dress has a hidden zip and a small back hem slit. Kate always looks lovely in Erdem and it's a very flattering piece for her at this stage of her pregnancy. Perfect for Spring! The dress is available for €1248 at Matches. It's also available Neiman Marcus and Net-a-Porter. 'For flawless, ladylike dressing, look no further than fashion darling Erdem. 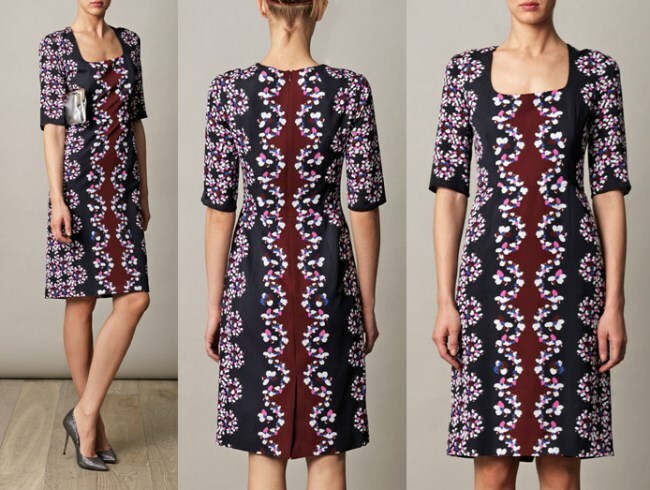 The label's signature Visconti-blooms work their way across a demure, fitted shift. Unashamedly feminine, work this dress as an elegant alternative to the LBD'. A closer look at the print. Kate teamed her dress with her navy suede pumps and her £245 Russell and Bromley Muse Clutch. Kate completed the ensemble with her Annoushka pearl earrings and her Asprey Button Pendant. Perfect outfit for a visit to a school - smartly casual dress, hair loose, plain shoes. Kate looks great. Love the touch of dog biscuits for Lupo. wow wow, Charlotte, I´ve been desperatley searching for pictures for an hour and here you are!You are great, really:) It seems as an interesting visit, very in match with her charitativ aims- education, children, support of addicts...well thought and chosen and planned IMO. I like the dress, kind of gipsy/boho chic which is very flattering on pregnant women (though I still thinks that Erdem is a bit too expensive). A also like she accessorized it with blue and no with black pumps. you are not the only one. I thought that the shoes and clutch were navy until I saw the description. Charlotte, I enjoy your timely posts and blog! Thanks for your dedication and passion for good, respectful and kindly representation of the Duke and Duchess of Cambridge! She is looking lovely and seems to be enjoying herself, life and great health in her pregnancy! I wish her and the Duke the very best as they begin a new phase of their lives! And the very best to you and yours! Deborah from Denver, CO. The shoes and the bag sure look navy to me. Kate looks great. The dress is very nice too. Will wait for the upcoming photos. she looks great as always! Can I just say how much I LOVE this blog? You do such an amazing job - I check it every single day for updates. Please keep up the great work. As you can imagine, I'm equally obsessed with Kate herself. That woman has NOT made a fashion misstep yet! Frankly, not a social one either. She truly is an inspiration. Love her and love this blog. I am so happy to see Kate so full of health and happiness! She's such a lovely young lady and mum-to-be. At last a good length on her! She looks nice and appriopriate. Lovely look. Very classy, bump is so cute. After days of badly proportioned coats that looked wrong on the Duchess, she looks slim and fantastic today in both that dress and coat. (Dress doesn't somehow look as expensive as it is, I guess it's the print.) Kate looks so much more elegant in this look, young and fresh and it's so less bulky than Sunday's look. What fantastic charities! It's horrible about that playground. Vicious and senseless. I'll look into donating. Hope we can from States. My Cavlalier says Go Henry! What a cute idea. Bet Henry does great work with kids. Cavaliers are the sweetest tail-waggers. Charlette do you know why there are hardly any professional photos of this visit? The DM only even has one photo so glad you have more! The DM should have plenty of photos now! I love the way the different Patronages are working togeather. and BCF = Blogroll Cambridge Family. Hello, MariBy! I really liked your guess! Can't wait for the 29th! Oh my I hope it is not a twitter thing. I don't know how to twitter. A bit of nerves with the speech but, I'm sure everyone was just so glad to have her there supporting them. Lovely to see her relaxed chatting with the different people. Another great post Ms. Charlotte. Thanks for all the hard work you do to bring this blog to us. Now I just love the Duchess's dress today. She is looking just beautiful and healthy. Nice to see the baby bump finally and not being hid by the coat dress. great job on all your posts! your site is my favorite! thank you for all you do!!! Charlotte, I am rellay wondering how you manage to be quicker than anyone else! You do a fantastic job! Thank you for that. This was the first time I got a little nervous during speech myself. Did you, Charlotte, know about the speech before? Maybe it was at short notice. Did you all also notice her dark eye shadow? I noticed it during the speech when she peeked to her notes. I don't think it very advantageous. Apart from that she looked great! Must have been quite a warm day in Manchester today. Hi Jules, I didn't actually know there would be a speech, Kate was very nervous but I thought it was a very passionate speech and she did very well. Thank you for the lovely and really quick post. I'm really grateful for this blog everything is in one place. I can't decide whether I like the dress or not but she is still looking really healthy and happy. At last we caught a glimpse of her tummy too. No problem at all. All of Kate's scheduled engagements or on the sidebar under 'Kate's Upcoming Dates'. Thank you very much. I though sth like that is the reason. Thank you. The dress is darling and the "at knee" length is so much more attractive than the recent too short hemlines she's been wearing. Now, does anybody know--is this a regular dress or is it maternity wear? Just curious. If an inexpensive knockoff is ever done, I will be the first in line. this is not a maternity dress - its a regular dress. Another great post.The dress is very fresh looking and it's nice to see a more appropriate length,the pattern is beautiful close up. I LOVE your site, so informative,do not go many days without a visit. Thanks for all the hard work it must involve. Hi Susanna- I was just wondering if you ever see the Duchess & William about town. Or walking on the beach? I bet it would be exciting see this beautiful couple. Hi Pauline, Yes I have been lucky enough on four occasions to see Kake in a well known shop in the town. She looks stunning and more stricking than pictures do her justice, and so tall.I hope I catch another glimpse before they leave Anglesey. Thank you for getting back to me. It must have been a moment you will never forget. Do you know if she has been in Anglesey lately? It is to bad that they have to leave such a beautiful place. I live in the US but sone day would love to visit the UK and Wales. That's ok Pauline, It is nice to have a chat. Yes I saw Kate 3 weeks ago while I was doing my shopping in Waitrose in Menai Bridge, funny how I seem to spend so much more when she is in the store, as I am in there longer!!! Thankfully no one bothers her while she shops but she must notice how many people are in the isle she is in.North Wales is beautiful, the landscape is wonderful(although the weather is not always ha, ha)today it is cold and damp at just 7degrees. I am sure if you visit you will fall in love with the mountains and coastline. I know we have discussed kate still being called kate middleton on here b4, I really do think it dis respectful for the TV clip shown in here to put her name as kate middleton duchess of cambridge. She is just duchess of cambridge no longer km. shame on the TV company. I don't know why but for me Kate looks so much older in that dress. I wish she does something else with the hair. She looks so nice on shopping trip with her mother. One of the things that make me follow Catherine, is that she is such a high profile woman but she seems so approachable, and I can see myself through her in lots of ocasions. She may be dissapointed by how nervous she was while delivering that great speech, but this shows us what an amazing woman she is. I think this is an honorable cause for her to support. I've read that the fire were set by 13 year-old boys... Is that right? She looks amazing! So posh wearing that coat while at the station! Hi Ana B., hope you are well. I so agree Catherine seems very approachable. Some people who rise to the top forget their humble beginnings. I truely dont think Kate will. :) ((((O))))) here's some sunshine for you. Why is The Duchess So Glamorous in everything she does!? @Kc Lion- The Duchess is glamorous because she is. She has grace, poise, is beautiful, I can go on but I will not. And this blog is great because Ms. Charlotte put's her heart & soul into the blog for us fans. And if you are a regular reader of this great blog then you would know. So I take it you are not a regualr here. I would be careful what you say about this blog or Ms. Charlotte because she has many true followers that will come off on you if you disrespect her. Just want to warn you. Hugs from (a very hot today) Portugal! I like her pregnant she looks healthy ans younger! Her face especially looks like it did when she first met william! Hope she doesnt lose to much weight after the birth she looks amazing! I agree, reminds me of the pictures from her earlier days with William. She looks so happy. I absolutely agree with you. She looks so much prettier, healthier and happier now. Definitely like the Kate from the college years. She looks younger too, with a fuller face. She has never been overweight and even with a few more weight on you could see she has a very athletic body. Hope she doesn't lose all the weight down to her wedding/Canada tour. My only "complaint" is that I wish she had worn her hair up in a pony tail or a bun. It just looks annoying having to "fight" the wind and having it all over her face. Plus at the end of the walkabout/activities, her hair just looks so unkept and messy. Those last paparazzi pics of her shopping with Carole, where she is wearing navy skinny jeans, black boots and a navy tunic with a lace peter pan collar... ok those :P she has a pony tail and she looks way prettier than today. I always say this: she has such a pretty face and features, her hair is a nice compliment to it all, but just showing her face, she looks great. Flawless appearance today & your blog has an impeccable report as always. Kudos! Is the speech posted anywhere? Dress suited the event - print that is bright and interesting for the children. Thank goodness she has no opaque tights and boots on today (nor at the Scouting event at Windsor). Perfect length on this dress - not too short for a change. Odd that these photos are labeled for Splash Mag as they are Reuters Photos and most were in Huffington Post before Splash put their label on them. Much better today Duchess! I personally don't like busy prints, but she looks like the fresh, young royal that she is. She is still not doing much with her hair... Overall love it! Just love her look today ! Love the dress, the pattern and the knee-length hemline ! Did a quick trip to Wythenshawe this morning as the first info was that Catherine would arrive at 11:30--but in fact it was 1pm. As I had a long standing engagement I just had time to see her arrive and then leave. Must admit I thought the dress was black, red and white, but no matter--just had the impression of beauty and elegance. Even for that quick look it was worth it---the photos are great, but the reality was even better. Jean, how very exciting! I loved reading your post!!! So happy that you got to see Kate in person and experience a piece of the happiness! :) Thanks for sharing! YEA! Kate looks fabulous today!!! I love the dress and thought the baby bump was adorable. :) She interacts so well with people and seems like a breath of fresh air wherever she goes. Bless her heart, she did seem nervous in her speech. As Charlotte said, public speaking will become easier with time. I think the fact that she seems to have no airs and graces is one of the reasons she is so loved by so many people. She is real, natural, and elegant. The one thing that did bother me is her hair dropping in her face and throwing her head a bit to get it back during her speech. I don't know.....maybe she should pull her hair back when she has a speech. Henry.....oh my word! He was such a cutie!!! I know Lupo will be feasting on his treats and be a very happy puppy tonight! So cute!!! Seems like a wonderful day and I am so happy for the Willows Primary School. I know it was a great honor to have Kate there today and to support these fabulous charities. I love how they are all working together and effectively using their resources. The children will be so blessed and receive so much good from these organizations. Best wishes on the rebuilding of the playground. It's great to see the community work together and overcome destruction! So happy to see Kate looking fantastic, happy, and healthy! Looking forward to tomorrow's post already!!! I totally agree with you, Kate - I think the Duchess does a great job at both mingling with people and public speaking. She will only get better with time. I really love her manner with everyone...so open and friendly! And perhaps, as others have mentioned, she'll start wearing a demi chignon when giving a speech so that she doesn't have to worry about it getting in her face. Love the dress and her look in it. But watching the video it made me realize that no picture can capture the true beauty of Kate. She is just so gorgeous! So well behaved and such a natural beauty! That`s why I adore her. I just wished the Erdem pieces wouldn`t be so expensive. Some links to Kate in the coat at the train station. She looks beautiful and glowing today! I thought the content of her speech was wonderful and exactly what you said Charlotte, she seemed so passionate. I would be so terrible at giving speeches, I think some forget she has only done a few and wasn't born to do this! But I just can not applaud her enough for putting everything she has into this job, she does an amazing job and is such an inspiration as is her love with William. Very excited for baby Cambridge and the announcement on the 29. Charlotte, you have the best blog out of all the Kate blogs I have seen. Thank you for giving us Kate fans something to be happy about! 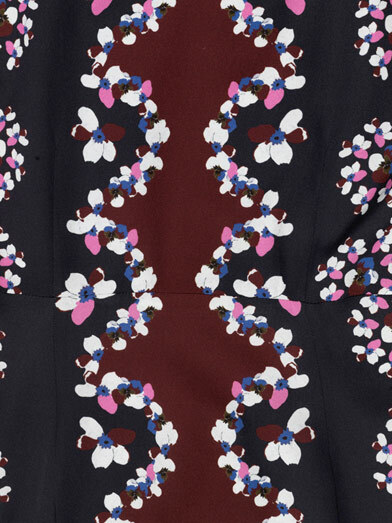 I generally really love the Erdem prints but this one is a little too busy for my taste. I think the cut is very flattering on her and overall she looks amazing, I'm just not a fan of this print at all. Love what she wore! For those who complained about the length of her former choices for wardrobe, it can be quite difficult to shop for the correct length at High Street shops for a woman of her physical stature. I sincerely appreciate Charlotte's mentions of the Duchess's charities. A great many of the Kate-blogs are not so conscientious of her charity endeavors. Keep it up! I Do have to say I loved the first picture of the beautiful Duchess with her baby bump really showing. She is really starting to show. So hopefully as her engagements in June come along she should really be showing. Can't wait. I did see a picture of the Duchess after the engagemetn today and she really looked tired. I sure hope she is not doing to much and is getting her rest after these engagement. From looking at the photo of her emerging from the train station, is it possible that she is holding her longchamp bag in black? She looked great, love this dress and she did a good jot with the speaking - except for trying to toss her hair back out of her eyes. Maybe a demi chignon when she's got to speak in public? Also, I'm not sure where people are coming up with their maternity math. I've read some comments about this not being a good dress for when she's seven months along. She's not. If the baby is due in mid-July, that would put her at the six-month mark or just over it. But this look was great and I'm happy to see a lower hemline. She is so modest! Such a wonderful example and role model for us girls and women alike! :) She is a beautiful picture of how great modesty can look like! She is an inspiration to me because I love how she can cover up but still look great!! Wish more Hollywood celebrity's would follow in her steps! Poor Kate - someone needs to give her speech lessons - she is going to need to give a lot of 'em in her days and the crown needs to work with her on how to give one and not get so nervous. part could be hormones of pregnancy - she sounded dreadfully nervous and shaky. Poor thing. It takes time and practice to do those little Royal speeches she is going to need to give zillion of. M, I have to agree. From reading the words of the speech written above, it was a fabulous speech with great meaning. Kate is not only delivering that speech to the few people gathered around her, but the millions of people around the world who will see it on the internet. It has got to be horribly nerve-wracking. She will be more comfortable with time. She's doing a fabulous job with her role in life and I think the Royal family know they have an absolute treasure! I totally agree with you M and Kate from Texas. It takes practice and right now the Duchcess does not give many speeches. So Beachgirl need's to lay of the Duchess. I beleive she has only given a total of 3 speeches since she married William. It is not that easy to get in frist of people and talk. Unless you have done it before you can't fault the Duchess. I know I have been there many times during my college years. But I improved, and now I don't get nerves when I get up and talk in front of people. If Kate shows improvement over time, the criticism she gets will deflate. She just didn't look that interested to me, but maybe that was jut the nerves. Well yet again Catherine is looking beautiful :) it was a lovely sunny day yesterday so no surprise that she ditched the coat. Actually though the sun was shining there was a very sharp breeze. However most pregnant women don't seem to feel the cold. A huge thank you to all of you take the time to comment and over time have created a wonderful community to discuss all things Kate. I was heartened to see so many of you offering support to those who had friends/relatives in the area where the Boston bombings took place. I love hearing your different opinions and thoughts. Jean - How exciting! I hope you had a great time in Manchester. Sarah - I am dying to tell you all about BCF and will be able to reveal all the details on Monday :) It's something I think all of you will be interested to hear about. Looking forward to seeing Kate at the NPG reception later! Thank you Charlotte for maintaining this wonderful blog! It has formed a wonderful community with so many fun people! You do a FABULOUS job! Can't wait to see Kate in a beautiful gown (maybe) looking amazingly beautiful! Pregnancy suits her well and she looks incredibly happy! While I wait......it's chilly and rainy here and I am wearing my mommy jogging suit.....LOL!!! I will live vicariously through Kate and her beautiful wardrobe. Must get my beautiful kiddos delivered to school! Have a wonderful morning! Kate did seem terribly nervous. She needs practice speaking but it will come in time. I do wish she would lose that feathery wave, and as soon as she gives it, she often turns from the crowd. Diana really knew how to engage the crowd. I think it will come for Kate from experience. Practice will give her confidence to break away a bit. Kate is at her best, wonderful, with a small group. I noticed how animated she was in the school chatting to the teachers. Also great with dogs. Henry was a bit nervous too but so-ooo cute! Thought Kate looked wonderful today. Knee length dresses like she wore in Canada and Singapore really suit her. I imagine that she may have it tailored down after the baby is born. Although, from what William says, expect there will be one more pregnancy. Hi Charlotte your job is always amazing. Each post is wonderful because you describe well what Kate does and give us more information regarding the place where is the Duchess in that moment. Can you suggest one thing if you can? When you update the "Kate's Upcoming Dates" you can indicate (if you know obviously) the expected time of the event? For example in the morning, afternoon or evening? So we could imagine which dress Kate can wear. We can use our imagination! It's very lovely to see the bump growing! with the thought I'm doing caressing her belly! Thanks for the great post! You're absolutely the best! I LOVE this dress on Kate. She looks great. The print has a special, slightly retro look. I like the fact it has some stronger colours. Kate really showcases navy blue very well, even as a neutral in her accessories. I'm thinking back to the Alexander McQueen (I think it was his design?) military style suit with gold buttons that she wore with a navy blue hat some time ago. Her slight nervousness during her speech brought back an incident that happened to me when I was pregnant. I'm a public speaker professionally (former trial lawyer in Canada- equivalent to a trial attorney in the U.S./ a barrister in the U.K.). Speaking on my feet was my bread and butter. When I was about six months pregnant, I was asked to give a reading at a church service. I had the Bible passage in front of me and just fumbled it. I think it was hormones. I also just never quite knew how I would feel when standing for any length of time. I remember rejoicing that I was never nauseous/morning sick as I don't know how I would have coped in open court. So- I can just imagine how Kate might have felt during her speech. Except in her case, the whole world can watch it. Even the sound of the flashbulbs/cameras in the background gives me the shivers. "Brava" to her for trying. Hope that everyone out there is well and enjoying all the engagements this week! Thanks for the great posts over the weekend, Charlotte. I was visiting my parents and had a great time catching up on the news when I returned home! :o) Looking forward to the rest of the week and - of course - next Monday!